Every week we bring you the latest cruise news stories, articles we’ve published, our latest Cruise Radio podcast, and recent YouTube videos. 1. On July 1, the Carnival Glory rescued a man overboard from Norwegian Getaway over the weekend off the coast of Cuba. According to a statement from Carnival, the man was found drifting in the water approximately 21 miles north of Cuba. He was brought onboard the Glory and treated by the shipboard medical team. Read the entire article here. 2. Royal Caribbean revealed more construction photos of their upcoming ship Spectrum of the Seas. This first Ultra Quantum-class cruise ship is currently being built at Meyer Werft Shipyard in Papenburg, Germany. 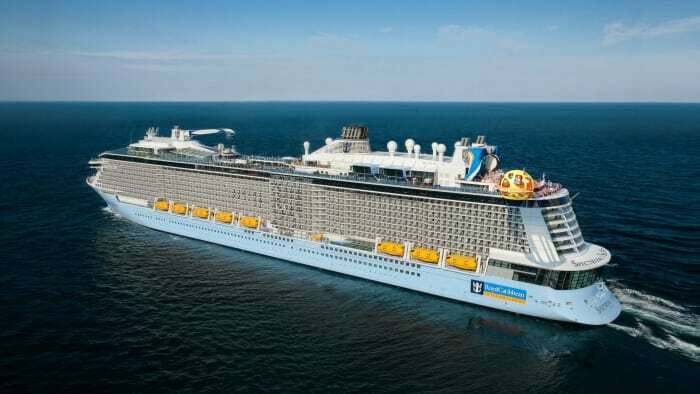 Read more details about Spectrum of the Seas here. 3. Holland America Line announced that the 37,900-ton Prinsendam has been sold and will leave its fleet July 1, 2019, and transfer to the German cruise company Phoenix Reisen. Prinsendam’s itineraries from July 1, 2019, onward are scheduled to be assimilated by Rotterdam, Volendam, and Veendam. Read the entire article here. 4. Carnival Cruise Line has updated their military cancellation policy for members of the armed forces and their families sailing with them. “Military guests who cancel their cruise vacation because they are called to duty or their leave has been canceled,” reads the policy, “are eligible for a future cruise credit.” It goes on to say that “if family members or friends are traveling with the military guest in separate cabins, they can cancel their cabin as well [and the] same policy applies.” The future cruise credit can be used for up to two years. Read the entire article here. This week’s episode of Cruise Radio was a Western Caribbean review of Norwegian Cruise Line’s Norwegian Getaway. The ship, which debuted in 2014, is currently sailing seven-night Caribbean sailings from Miami. The guests interviewed had previously only sailed with Carnival Cruise Line and Royal Caribbean. We focus on the Green Eggs and Ham Breakfast on Carnival Cruise Line this week. This character breakfast is typically held on the last sea day on all of Carnival’s cruise ship. The cost is $5 and includes a photo opportunity with Cat in the Hat, Sam I Am, and Thing 1 & 2. Read the full Green Eggs and Ham review here. This week we posted a time-lapse video of Carnival Horizon sailing out of New York City, sailing from King’s Wharf Bermuda, and a really early 4:30 a.m. sail in back to New York Harbor. The video is sped up to 40x times normal speed and gives you a unique perspective of sailing in and out of iconic New York Harbor. You can subscribe to the Cruise Radio YouTube channel here.